Did you go and see the show? 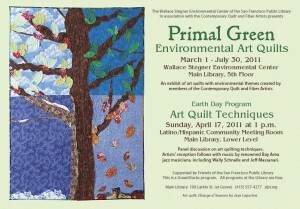 Primal Green is a show of environmental art quilts at the Main Branch of the San Francisco Public Library. AND! Quiltmakers will be speaking tomorrow about their quilts, the process and art quiltmaking, in general. The event is called Art Quilters in Conversation. It will be held in the Latino/Hispanic Meeting Room, April 17 at 1pm. See more information on the San Francisco Public Library website’s calendar page. The Wallace Stegner Environmental Center is one of the special collections at the Main Branch and, after a year of work with the Library, CQFA has over 20 quilts and fiber art pieces on display. The quilts all have an environmental theme. The show will hang until July 31 and be available to viewers during the Library’s normal open hours. Hope you can stop by and see it, especially if you can’t make the presentation. Check the library’s website for hours. 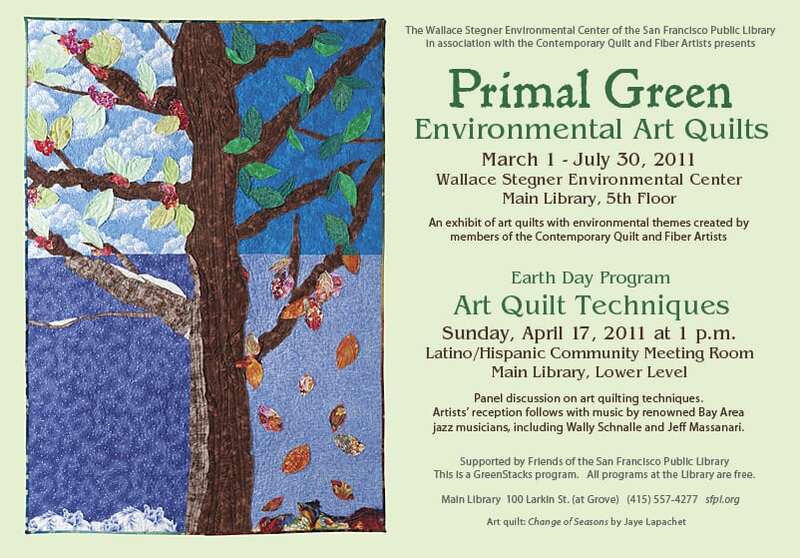 Primal Green, the art quilt exhibition at the San Francisco Public Library, has some information on the Green Stacks portion of the SFPL website. Hope you can see the show.